If we truly wanted to get this Middle East business settled once and for all, we need to do is what I’ve advised four Presidents to do – initiate the Dudikoff Option. The Dudikoff Option is so simple, it’s beyond bizarre that it hasn’t been thought of outside of several terrible thrifty action movies. The scenario plays out like this: an evil and appropriately swarthy military leader in some Middle East country comes up with some scheme which threatens to make things even worse over there so the U.S. military deploys the only asset in its arsenal that has the required combination of third tier action hero status, bland to nonexistent personality (so as to not draw attention to himself during daytime invasions of various installations), and martial arts skills that will invariably barely be featured at all during the mission. Add bloated up has been rapper and completely unnecessary obnoxious reporters and 90 minutes later, the President is declaring peace has broken out while the Dude himself is rolling around in bed with the sexiest special forces tech expert to ever override a nuclear launch code! Of course those of us who’ve ever geared up for a mission where failure was not an option know that these sorts of things are never without their hiccups. Freedom Strike is no exception and right from the get go, things threaten to unravel, even before Michael “the Dude” Dudikoff (American Ninja, Avenging Force) can get into his black special ops uniform! 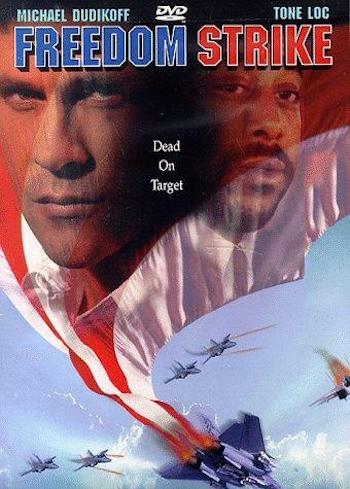 At the start of the film, the viewer is informed that some special United Nations resolution created the Freedom Strike special ops team thus causing every American in the audience to utter a collective “what the frig?” I thought I was supposed to be rooting for Freedom Strike, not hoping that their new world order, one world government agenda would be terminated with extreme democracy by some other folks! Maybe back in 1998 when this movie was released, the majority of Americans still bought into the concept that United Nations was some sort of benign organization that helped mediate disputes amongst nations we can’t even pronounce, let alone place on a map. It seems like so much naiveté now that their goal of destroying the United States and engineering the greatest ever transfer of wealth from regular Americans to third world turd holes through such criminal enterprises as “climate change” has finally been revealed. Don’t give up yet though because what a film like Freedom Strike can so clumsily introduce, it also can just as soon totally forget and never reference again! So it was that Freedom Strike was commanded by Americans from American ships and there was never any mention of it having anything to do with the U.N. A couple of people on the team did have accents, but I’ve never had any problems with ex British SAS agents pitching in when Lady Liberty needed an extra set of hands to fire automatic weapons and snap necks. Freedom Strike though seems determined not even to make it past basic training for these sorts of movies when the first mission is revealed. The team has to invade Syria in order to steal a microchip that has the capability to shut down all radar and communications of the American military! But who could have developed such a superior piece of technology? China? Russia? Brilliant hackers? Rogue elements in the U.S. intelligence community? Nope. Syrian military. You know, the same Syrian military that appears from the film to be made up of four jets, one truck load of soldiers, a couple of techs running the nuke plant, and their dastardly cigar chomping leader. And who are consistently defeated by an invasion force that consists of the Dude and three other people! Still, you’ve got to give these Syrians some credit. Even after the Dude takes them out in the first third of the movie and recovers the chip, they get right back in the game and pull the old fake camera crew trick (also seen the year before in the Dude’s Strategic Command) and try to take out the President aboard an aircraft carrier. They only manage to hit their own leader instead, but it’s with a special explosive bullet which causes Tone Loc to go all CSI on everyone and explain about how there’s some “green stuff” in it that could come into contact with something hard and blow everything up! Those crazy Syrians aren’t done yet though! Next up is their ill-advised attempt to take control of the nuclear plant in their country that the U.N. is in charge of. Another Dude invasion force follows and the whole affair proves fairly forgettable except for when the evil general spit in the pushy female reporter’s face. This does quite a bit to humanize the general since everyone watching at home was longing to do the same. You wouldn’t think it would be too difficult to structure such a routinely bad special ops movie, but Freedom Strike must have been made by guys who liked Top Gun, but were forced to make a Dude movie instead because there’s all these scenes of fighter jets battling while the Dude is either anxiously looking on from the ship or is busy on a mission. You could easily write those scenes off as pure filler except for the fact that the bickering between the TV reporters and their boss who ultimately had nothing to do with the story provided enough filler for three Dude flicks! Further alienating its audience, Freedom Strike painfully under utilizes the Dude and he barely has to kick anyone in the head. Additionally, most scenes don’t ring true (has there ever been a more deserted aircraft carrier that the USS Nimitz when the Dude is chasing the terrorists through it?) and the story doesn’t even make any sense. What is all this blather about an Arab war? Last time I checked the problems weren’t Arab countries fighting each other. The movie even botches its gratuitous casting of a hip hop artist as Tone Loc has a glorified cameo that could have been played by anyone. On second thought, if anyone asks, it’s probably best if we just say that Freedom Strike was in fact just another U.N. fiasco.